It seemed like the universe conspired to make Julie and Jason's September wedding at the Harrington a picture perfect day. After days of worrying about the weather for their outdoor wedding, there wasn't a cloud in the sky when this gorgeous bride and her long time honey went down the aisle. Love this shot of my stunning cousin with her bridal bouquet and her husband Jason. Jordan Quinn did an amazing job capturing the day and the decor. 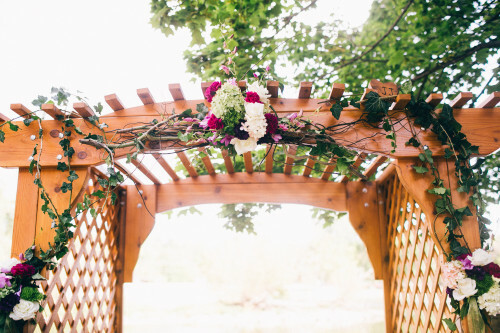 This beautiful arbor they were married under was a wedding gift to Julie and Jason. It now hold a special place in their back yard. Check out the sweet "JJ" on the upper right. The bridesmaids wore strapless dresses in a stunning shade of bold purple and carried bouquets of coxcomb, green cymbidiums and deep purple dendros to coordinate. Deep purple hydrangea, curly willow, orchids and candlelight accented the cocktail hour. Both centerpiece versions featured various types of orchids in fuchsia, purple and green with curly willow accents. The aubergine linens gave the saturated colors added drama and looked great in the reception room. She loves cars and manages properties. He's a chef. They're high school sweethearts and so unbelievably fantastic together. The wedding favors were voodoo dolls and pralines because they got engaged in New Orleans. Need I say more? Working with Heather and Ben was a complete pleasure from start to finish. The red, teal and black color scheme looked fabulous at Ravenswood Event Center and timeless red roses added to the vintage feel of the space.